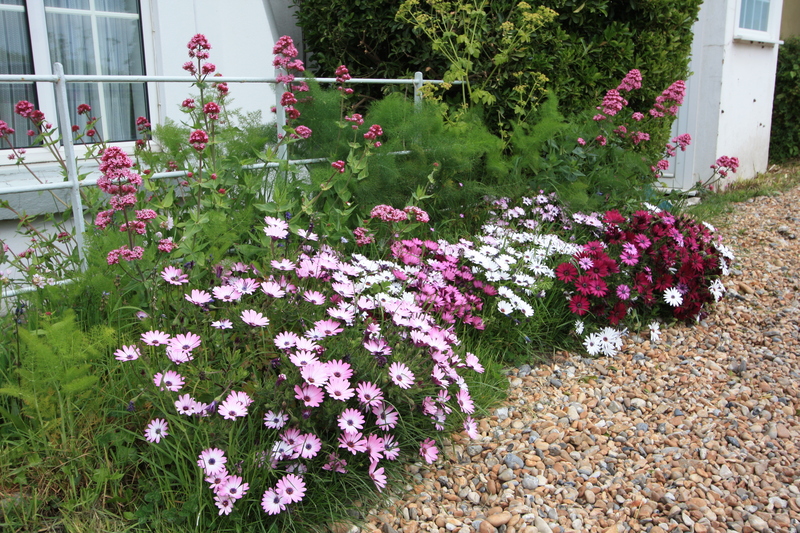 As indispensable plants for seaside gardens go, ostespermums are high on the list, and most certainly in the top ten. They are low-growing, sun-loving sub-shrubs which produce a profusion of large, daisy-like flowers in spring. Modern varieties continue to bloom throughout the summer and autumn, but lack the poise and elegance of plain old Osteospermum jucundum AGM, a plant which my grandmother used to grow on top of her hedges. These carried white-petalled flowers, plum on the reverse, high above a dense cushion of green foliage. At this time of year osteospermums can be picked up for a song in garden centres and florists. Colours range from white through pink, purple, yellow, orange and copper to burgundy red, but there are no pure reds or blues. Planted out immediately they make great companions for tulips. However, be warned, they are often treated in the nursery with a growth inhibitor to keep them short and neat in their pots. This means that they tend to sit looking rather sulky after the first flush of flowers is over, before springing back into action. Deadheading isn’t necessary, as modern osteospermums tend not to set seed. I do remove spent flowers, purely to keep the plants looking chipper. 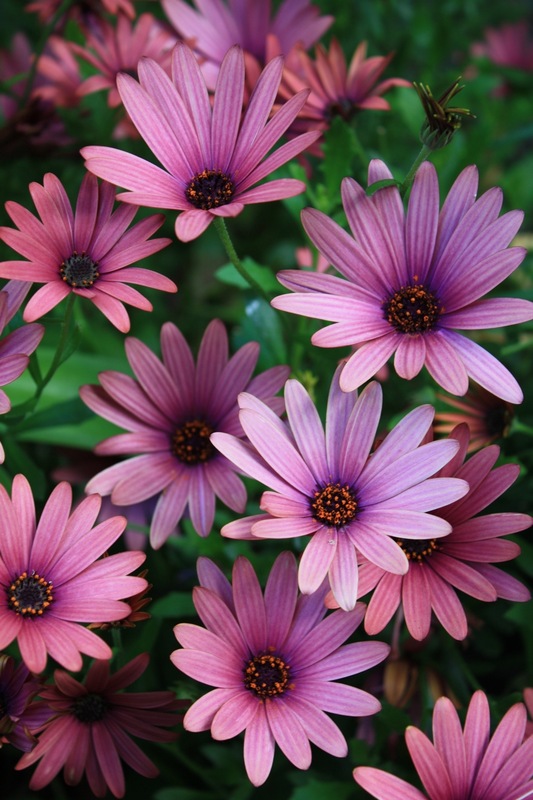 Osteospermums like warmth and sun, although they will tolerate poor soil, salt-winds and drought. After a dry spell it may take a while for flowering to resume, and over-wetting can prove fatal. Osteospermums perform brilliantly in pots and on dry slopes where little else will prosper. 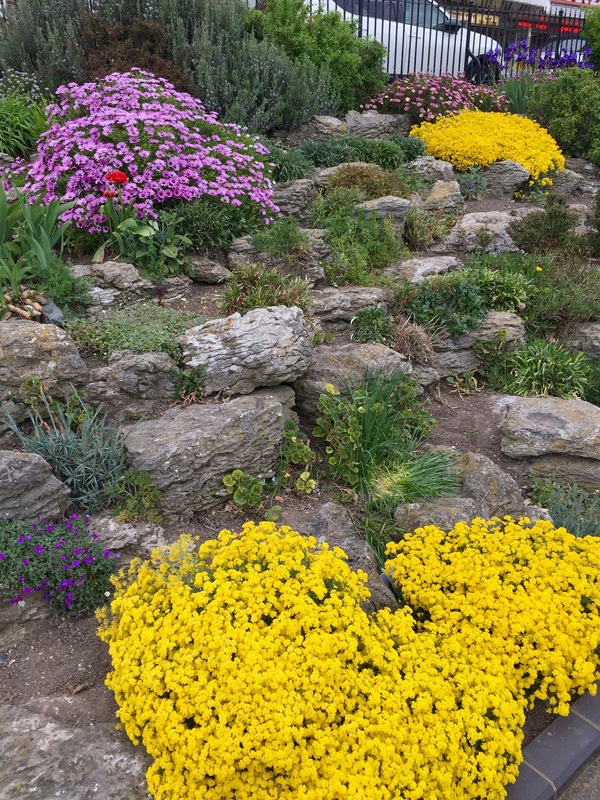 Here in Broadstairs they form vast swathes on the seafront in abandoned Victorian rockeries, surviving both neglect and the dubious attentions of the council maintenance people. Although they are technically tender, in seaside locations they will often shrug off adverse winter weather. I have never lost an osteospermum to cold, only overwatering. If you wish to multiply a particularly desirable plant (I have a copper-coloured variety which seems to blend with all the colours I like in my garden) then softwood and semi-hardwood cuttings are a breeze to root, quickly producing bushy plants if pinched out regularly. Overgrown plants can be cut back hard after flowering and will reshoot nicely. 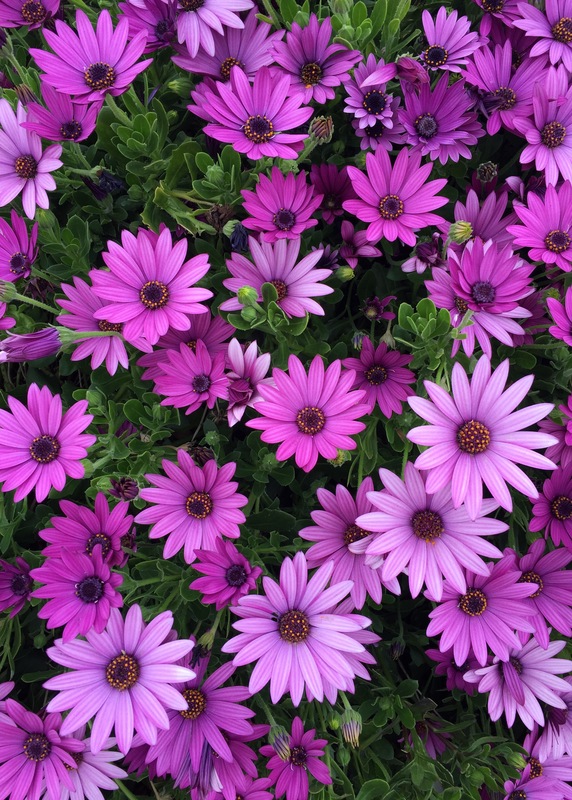 Although not the height of sophistication or originality, osteospermums are inexpensive, readily available, tolerant of neglect, bright and cheerful. If you live by the coast, or anywhere warm and dry, then few plants are as colourful and rewarding so early in the season. Thanks so much for this; having moved to Hythe from Bromley I have to learn everything I know about gardening again ! Really missing my garden & felt like I was walking aimlessly around Coolings garden centre yesterday as not sure what would survive here. Would love your full top 10 list …..
Beautiful color that really adds a pop to the garden. Thank you for sharing this! Thanks for this summery post Dan and wishing you and HI a happy Easter holiday weekend! I live in Perth, on the West Coast of Australia where we garden in infertile sand. We love these South African native daisies and I bought a burgundy one yesterday for a hanging basket (created to team tones of orange and burgundy). It’s autumn here – we have them flowering now until spring. In our hot Mediterranian climate (we’ll get a few baking days in the 40ies) we only ever lose them from underwatering in summer. They do well on our twice weekly water restrictions and I usually propagate by layering which happens naturally as they tend to romp through the garden. We cut them back very hard when they finish flowering or they get leggy and unattractive. Was on the prom with family yesterday and delighted with the osteospermums on the old rock garden. They certainly come into the category of ‘flower-candy’. Was also surprised to see the very ordinary old bearded irises in full flower so early. I wonder if any of the modern varieties would succeed there? I am sure they would with the sunny aspect and sharp drainage June. I wish there was more to spend on the maintenance of Victoria Gardens. They often look a bit sorry for themselves. They are at their best right now, with the wallflowers, pansies and osteospermums in full bloom, although heaven knows who chooses the flower colours. They are a bit clashy even for me! Shame my front garden doesn’t get a bit more sun! They do look such cheerful plants. Will you be going to Saltwood Castle plant fair on April 29th? Always a good plant buying opportunity and just up the road from you. We always enjoy it.